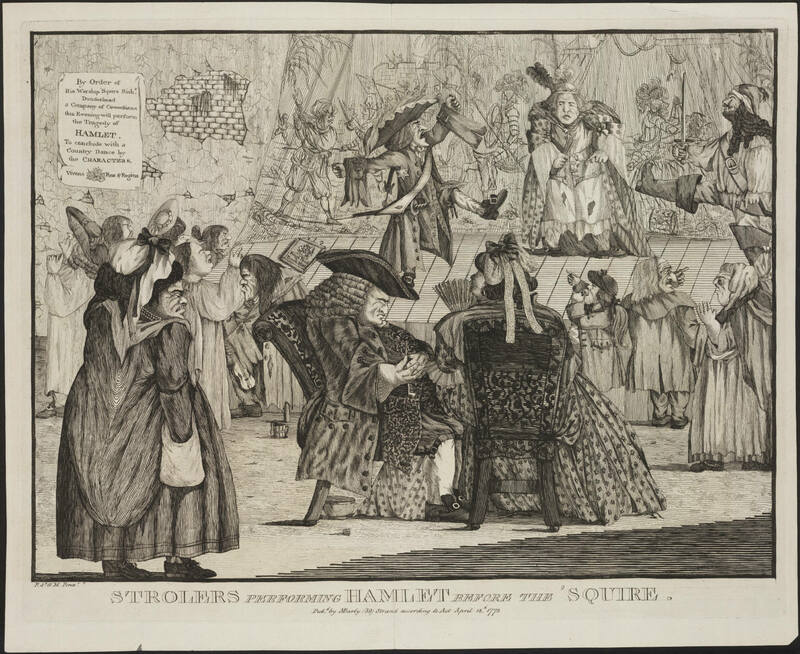 The crowd in Strollers performing Hamlet before the squire, by R. St. George Mansergh, tells its own story about Shakespeare—and his audiences. Here a raucous country audience observes Laertes’s duel in Hamlet, while the corpulent squire dozes over his pipe next to his wife. The caricature sets the scene: “By order of His Worship ‘squire Richd Dunderhead … a company of comedians this evening will perform the Tragedy of Hamlet. To conclude with a Country Dance by the CHARACTERS.” The spectacle occurs in the “Kings Head Punch House,” with a tattered tapestry for scenery and actors in threadbare clothing. What a wonderful image: it reminds me in a funny way of the illustrations to Alice in Wonderland! I’ve never seen it before so I assume it’s quite rare.